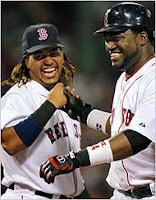 Has David Ortiz pulled a Palmiero? Rafael Palmiero famously shook his finger at congress several years ago, vehemently denying that he ever took performance-enhancing drugs. Earlier this year, when Alex Rodriguez was outed as a steroid user, David Ortiz came down hard steroids, saying anyone caught using them should be suspended for a year. Today The New York Times reported that he (along with Manny Ramirez) is on that infamous list of 104 names of players who tested positive in 2003. Assuming the Times is correct, did he not know he was on the list? I guess it's possible that he didn't know, but not likely. The big question this revelation raises is whether or not Boston's 2004 World Series Championship is tainted. That's hard to say because who knows if Cardinals players were also using steroids? What I don't understand is why this question was never brought up until now. When Manny tested positive a few months ago, I expressed my shock over the fact that no one was asking this question. True, 2004 was nearly 5 years ago, but still, it was only 5 years ago. People had the nerve to jump all over Alex Rodriguez and the Yankees, wanting to know if he used steroids as a Yankee, and the Yankees haven't won a championship while he's been with them! Yet, I barely heard a peep out of anyone about the 2004 Red Sox when Manny was suspended.